Review: Blast away those gloomy clouds with this wonderful set from the Street Edits clan. 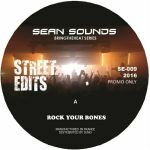 Having previously been spotted on Lumberjacks In Hell with Rahaan, it's evident that Sean Sounds knows exactly what he's doing when giving classic funk and disco a tasteful re-rub. "Disco Child" on the B-side is likely the big party starter, but there's grade A soul to be soaked up elsewhere too. "Rock Your Bones" is an especially sunny jam with African flair in its bones, while record closer "Get Up & Party" has a classic 70s Motown feel to it. In the face of overly slick re-edits this is a release with a welcome grittiness to it.